This is a "Luxury Car" cocktail series drink I have been planning to make since I got Antica Formula vermouth. It isn't luxury without good vermouth, after all. You can see the Golden Cadillac and I will soon make a Bentley. 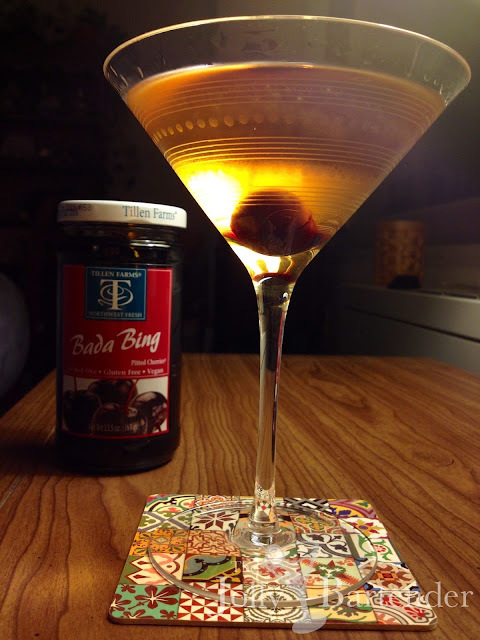 Like the Monte Carlo, it also uses Benedictine, but I wanted to feature Bada Bing cherries in this entry. The Rolls Royce doesn't call for a cherry garnish, but Bada Bings aren't maraschino cherries. They are rich and plump bing cherries, a flavor that goes well with this herbal Martini variation. Bada Bing are organic with no artificial coloring, so if you have issues with maraschino cherries, these won't bother you. Combine all ingredients in a mixing glass with ice. Stir and strain into a chilled cocktail glass.